As promised I visited the Regan Gentry teeth. It was a gorgeous day on Saturday (my camera didn’t cope too well with the sun) I’d dropped someoneiknow off at his rugby game in town and had the car loaded with the kids so off we went. 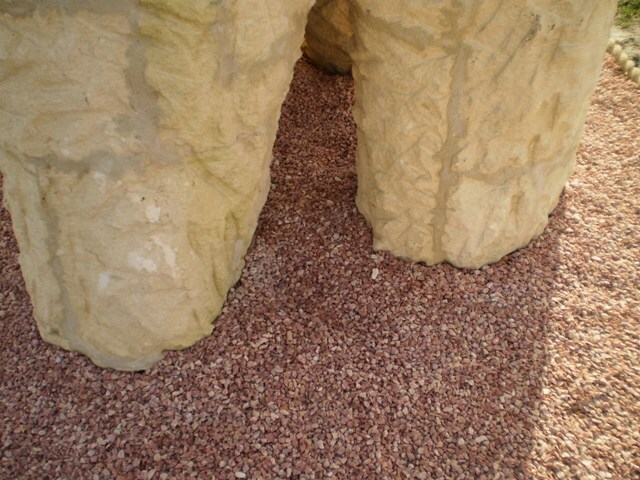 There are 2 sets of 3 teeth (molars) carved from blocks of Oamaru stone and set into pinkish gravel. Not set in very far which could indicate severe gum problems. The teeth are supposedly set at the head/mouth of the harbour although I’d say that is arguable (I am such a nit-picker). Now I have to say I think the whole idea is dumb. Intellectually, I feel that I shouldn’t like these and yet I do. So do my kids. Even in your kids books. Here are two pages from “The Happy Rag” by Tony Ross. It seems the central action takes place at the foot of a Henry Moore. We’ve had this book for years and I’ve only just noticed it. It is one of these sculptures though isn’t it? A little while back I found this sculpture in the local gardens. I love it to bits and was a little concerned that being where it is, that one day it might just disappear. 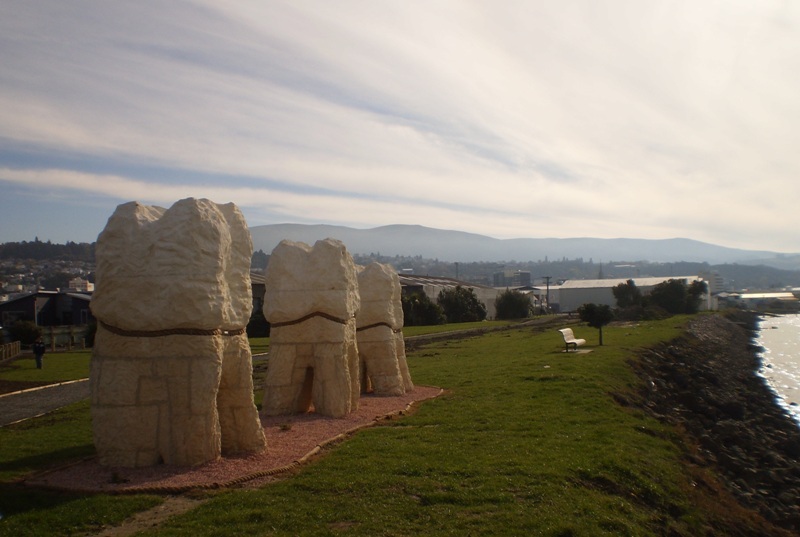 I decided to contact the Otago Sculpture Trustand was subsequently contacted by Peter Nicholls, sculptor and Chairperson of the OST. After some discussion of where the piece was and total lack of record of it, Peter recently took up the challenge to come and visit it. I am very heartened to hear that for a start the sculture is still there (it was slated to be removed 2 years ago) and it is possibly going to be ‘taken under the wing’ of the sculpture trust. Today I finally got out to Port Chalmers and the Hotere Sculpture Garden. I’ seen photos. I’d read about it but it was a bit of a let down. I am not sure why. I liked Chris Booth’s Aramoana well enough. Black Phoenix II has a sturdy fence around it and I think its a wonder they didn’t “cover up” Shona Rapira Davies ‘They do cut down the poles that hold up the sky’. The whole history of how this garden ocurred is kind fo sad – the ports and business demolishing art so I guess it is good a middle ground was reached in having this garden at all – one shouldn’t complain. Back to Black Phoenix II. I gather it is built from the same burnt out boat as Black Phoenix (in the Te Papa Collection). I much much prefer the latter and hope it gets out and seen more. It is an astounding work. I found Black Phoenix II difficult and couldn’t even get a really good photo of it. Next visit out this way I hope to see the Hotere’s at Carey’s Bay Hotel. I think it is a fountain and I wondered if someone just stuck some slabs together or whether it was ‘designed’. Either way I think it looks great when not being an active fountain. The pointless little brick wall in front detracts a bit though.